AP Police Constables, Warders, Firemen Hall tickets 2019: AP PC, Warders, Firemen Hall Tickets 2018 released. Andhra Pradesh State Level Police Recruitment Board (APSLPRB) has released the AP Police Constables, Warders, Firemen Hall ticket on its official website. The candidates who have applied for the AP Police Constables, Warders, Firemen recruitment examination 2018 can visit the official website of the AP Police Recruitment Board to check and download their hall ticket. The hall ticket has been released for SCT PC (Civil) (Men & Women) - Post Code No.21, SCT PC (AR) (Men & Women) - Post Code No.22, SCT PC (APSP) (Men) - Post Code No.23, Warder (Men) - Post Code No.24, Warder (Women) - Post Code No.25, Firemen (Men) - Post Code No.26. AP State Level Police Recruitment Board (SLPRB, AP) issued the Police Constables recruitment notification and invited applications through ONLINE mode http://slprb.ap.gov.in from 13-11-2018 to 07-12-2018 for AP Police Constables, Warders Recruitment. AP Police PC Written exam hall tickets download from 24-12-2018 to 04-01-2018 and Preliminary Written Test will be held on 06.01.2018 and after Physically efficiency tests to conducted from 09 to 20-02-2019. The AP PC Recruitment Final Written Exam will be held on 17-03-2019. AP Police Prelims Hall Ticket 2018: Andhra Pradesh State Level Police Recruitment Board (APSLPRB) has released hall ticket or admit card for Civil & AR and APSP, Warder & Firemen Posts for the preliminary written test. Candidates who have applied for the examination can easily download the admit card from the official site of Andhra Pradesh State Level Police Recruitment Board at slprb.ap.gov.in. The recruitment drive is to fill 2723 posts of Police Constable, Warder, and Fireman. The preliminary examination will be conducted on January 06, 2019 in the state. The registration process began on November 12 and ended on December 07, 2018. The candidates selected for the post will get pay band of Rs 16,400/- to Rs 49,870. The applicants will be eligible for stipend and allowance during the time of institutional training. 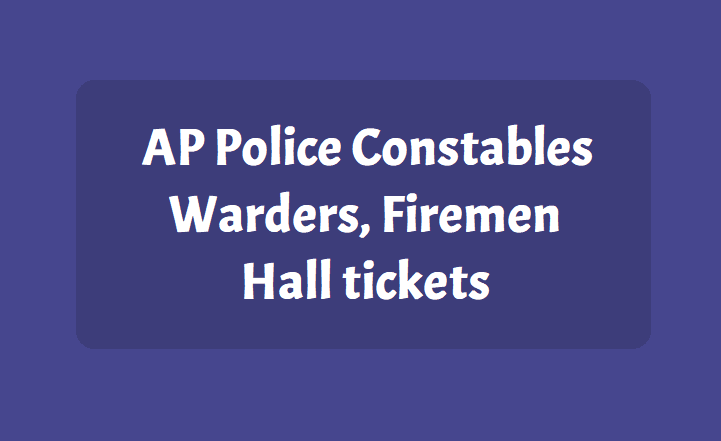 AP Police Constable hall ticket 2018 download: The hall ticket for the preliminary examination of the AP police constable recruitment has been released on the official site of the board. Around 3.88 lakh candidates have applied for the 2,723 vacant posts in Civil, Armed-Reserve, APSP departments as well as firemen and jail wardens. The exam is scheduled to be held on January 6, 2019. Candidates have to answer 200 multiple choice questions in three-hour time. The aspirants who cleared the prelims exam will have to undergo physical examination test. The final merit list will be released after clearing the mains examination. Step 4. In this page, click on the link of "SCT PCs Civil & AR (Men & Women) and APSP (Men), Warder (Men & Women) & Firemen-2018"